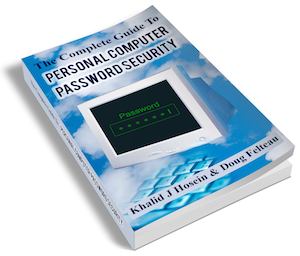 Announcing our book on Computer Password Security! 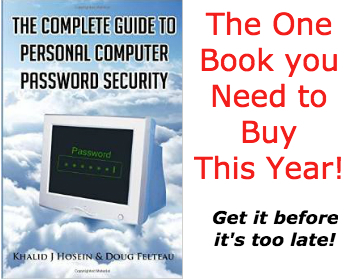 Gizmos for Geeks > Books, Music and Movies > Announcing our book on Computer Password Security! We are proud to announce that the geeks, yours truly – Doug and Khalid, have written and published their very first book. We saw a great need for a single source of compiled information and advice that the average computer user could follow to improve and secure their online accounts and passwords. Being in the IT and information security field, this is a subject that we speak about constantly, and yet while there are thousands of articles online, there were no books that nicely encapsulated all of that knowledge. Every week, thousands of passwords and/or identities are stolen, and those are only the breaches we know about. Don’t become a statistic – follow the easy-to-follow advice in our book to greatly reduce your exposure. As a holiday special, we’re giving it away tomorrow, Christmas Day, 25 Dec 2014! We’d love to hear your thoughts. If you have a few minutes, help out other shoppers by posting a review on Amazon. congrats! im ordering one right now.